The individual scores you see on Messly are all based feedback from junior doctors on the GMC Survey 2017 (learn more). Additionally, you'll see that each score is colour-coded to represent the quality of the training. Our quality ratings are all calculated based on where a programme/rotation score falls in comparison to its benchmark group. For example, if you're looking at General Surgery rotations, the score will be compared to a benchmark group of all surgical specialty rotations at that level. 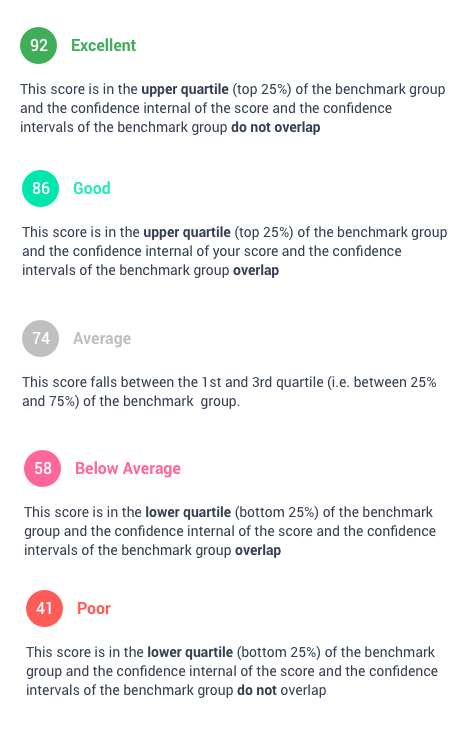 The quality rating is therefore not absolute, but relative to their benchmark group. For example, a score of 78 for Overall Satisfaction in Accident & Emergency North West Thames is 'Excellent' when compared to it's benchmark group (all A&E programmes), but the would be 'Average' for an Anaesthetic North West Thames when compared to it's benchmark group (all Anaesthetics programmes). You can also infer that that Anaesthetics Programmes generally have higher satisfaction than A&E training programmes.